Matt Edwards and Darren Garrod continued their excellent run of form as the Welsh pairing won the John Mulholland Motors Ulster Rally at the weekend, August 17-18. The M-Sport crew mastered the mixed conditions to win three events from three this season to firmly cement their place at the top of the Prestone MSA British Rally Championship standings going into the second half of the season. The BRC reached its halfway point on the Ulster Rally, and in its sixtieth season, Britain’s premier rallying series didn’t fail to deliver in excitement. The Northern Ireland classic played host to, two hard-long days with 100 miles on demanding bumpy tarmac through the Irish lanes. Changeable weather conditions with torrential rain making an appearance on the opening day, followed by glimpses of summer sunshine on the second made for battles aplenty on varied road surfaces – a treat for the hardy spectators watching stage-side. Matt Edwards and Darren Garrod once again produced a BRC masterclass. The Welsh team had won the opening two rounds of the action-packed series and came to the Ulster with hopes of keeping out of trouble with the aim of a podium to maintain their BRC title tilt. The classic event was the scene of Edwards’ BRC R5 debut two years ago with the north Wales driver growing in confidence with every rally since. Edwards threaded himself in gently, with the fourth fastest time on the first competitive test before working his way up the order on the opening five stages. Picking up the pace with every stage and staying out of trouble, the Welsh Wizard ended the opening day on top, with slender 0.6 second lead over Rhys Yates and James Morgan going into the final day. Yates’ Skoda Fabia R5 proved well-suited to the longer, faster and more flowing stages while Edwards in the agile Fiesta R5 enjoyed the tighter natured tests. He snatched the lead back on the opening test before Edwards reveled in the tight afternoon stages to haul himself clear of the chasing pack to take his third straight victory. David Bogie and John Rowan produced a carbon copy of their Ypres Rally result last time out. The Scottish star struggled with making the correct tyre choices but when he was on the right set of rubber, the Skoda Fabia R5 driver got the hammer down and was pleased to secure another podium to swell his championship points account. Yates continued his European rallying backpacking trip with a visit to Northern Ireland. Despite contesting numerous events throughout the continent, the Englishman had never driven the Skoda Fabia R5 on wet Tarmac before. Fearless as ever, the young-gun fought hard and reveled in the duel with Edwards. Pushing hard on stage nine, the CA1 Sport driver went off, causing an almost instant retirement. Along with co-driver James Morgan, the pair patched up the Czech machine and charged on once more to round out the podium with a fine third place. Despite a few spins and struggling to find a rhythm in places, Alex Laffey and co-driver Patrick Walsh continued their top five consistency by equaling their Ypres Rally result with a fine fourth in Northern Ireland. Local hopes for the outright win were dashed when Jonny Greer (Belfast) and Marty McCormack (Draperstown) had to retire from the event. Greer, in his Ford Fiesta R5, suffered an uncharacteristic crash on the opening day while McCormack called time on his event on the final morning after several excursions and not wishing to risk further damage to his Skoda Fabia R5 further. In the Prestone MSA Motorsport News Junior British Rally Championship, the action was red-hot across the two days in the front-wheel-drive R2 class for drivers aged 26 and under. Steve Røkland went quickest out of the blocks and looked to have it all sewn up after the opening day with 15.3 second advantage in his back pocket with a day to go. With Dai Roberts expertly guiding the Norwegian in the Peugeot 208 R2 the pair built-up an even bigger cushion at the start of the second day but had not accounted for a late charge from local man Josh McErlean and navigator Aaron Johnston. The Irish teenager threw caution to the wind to an attempt to catch Røkland. With only two stages to go, a head-to-head was set-up between the ice-cool Norwegian and the confident homegrown hero with less than half-a-second between the two crews. Unfortunately, it wasn’t to be for McErlean as a puncture and a small excursion put him out of the event to allow Røkland to sweep his way to victory. William Creighton and Liam Regan in their Peugeot 208 R2 couldn’t quite match their Junior BRC Ulster Rally win of 2017 but were pleased to return to the podium after a retirement on the Ypres Rally. They kept out of trouble and played their joker, earning Creighton an additional four points to put him right back into the championship hunt. Kevin Horgan and Liam Fouhy stepped onto the rostrum for the first time in their Skoda Fabia R2. 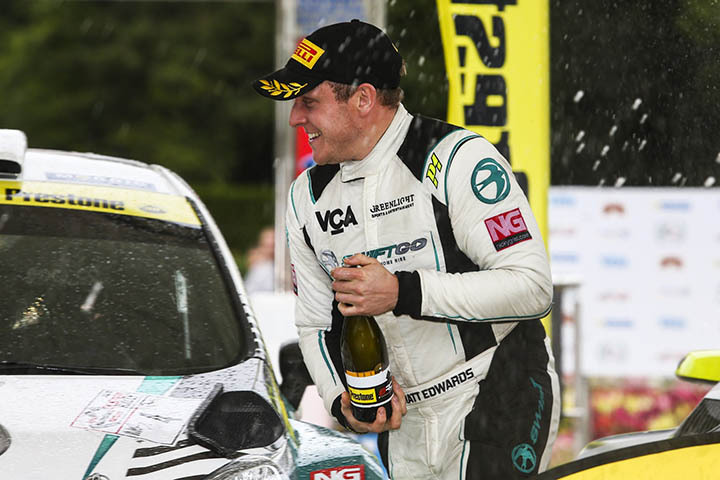 The Irish pairing were disappointed by their first day performance but a spirited fight-back led them to their best result to date as they sprayed the champagne at the finish in Antrim. James Williams crossed the Irish Sea as series leader in his Vauxhall Adam R2. Along with new co-driver Dale Furniss, the Welsh duo were on the cusp of a podium before a visit to the scenery damaged the radiator forcing them into an early bath. In the Cadet Cup, Scottish driver Finlay Retson in his Ford Fiesta R2 broke his BRC duck – making him the third different winner in as many events. Jordan Reynolds returned to the rostrum to finish second while local fans were delighted to see Johnnie Mulholland clinch the final spot on the podium on his home event to move him up the Cadet Cup standings order. John Morrison and Peter Carstairs thoroughly enjoyed their Ulster escapade, taking maximum National Rally Cup points. The series will blast back into action in a month’s time with Rally Isle of Man on September 13-15. Prestone MSA British Rally Championship Standings after round 3/6. Prestone MSA British Rally Championship Standings (Co-drivers) after round 3/6.